Glasgow Computer Recycling are pleased to announce that we are now offering a toner recycling service. 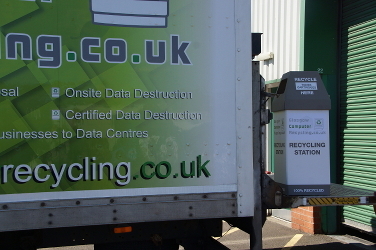 It’s a fairly straightforward service and we aim to make it as easy as possible – we’ll drop off empty recycling containers that are clearly marked and suitable for placing around the office, then simply contact us when they are full and we will take them away and swap them out for some more empty containers. As an introductory offer for this service we’ll even take away any used toner you have at no charge when we drop off the recycling containers (within reason of course – up to 2 containers of toner). We believe this makes it simple for our customers to responsibly dispose of their waste toner cartridges and avoids the mess of storing used toner around your office. Note this isn’t a “toners for cash!” service that you sometimes see – we’ve looked in to these and they’re not all they are cracked up to be. These companies are generally only interested in a small number of the toners you have – and they only pay pennies per cartridge – so it’s worth balancing whether it’s worth the time, effort and expense (not to mention mess) of getting your staff to go through and catalogue the old toner only to find it’s not worth much. Then of course what do you do with all the toner these companies don’t want? As always feel free to get in touch any time to see how we can help with your old toner disposal requirements, and secure disposal of all your redundant IT equipment.